Synthetic peptide within Human TMEM132E aa 711-741 (C terminal) conjugated to Keyhole Limpet Haemocyanin (KLH). The exact sequence is proprietary. MCF7 cell lysate; Mouse testis tissue lysate; MCF7 cells. ab170376 was purified through a protein A column, followed by peptide affinity purification. Our Abpromise guarantee covers the use of ab170376 in the following tested applications. WB 1/100 - 1/500. Predicted molecular weight: 107 kDa. Note=TMEM132E is located in a region involved in a heterozygous deletion of approximately 4.7 Mb; this deletion, involving the NF1 gene and contiguous genes lying in its flanking regions, is observed in a patient 17q11.2 microdeletion syndrome, a syndrome characterized by variable facial dysmorphism, mental retardation, developmental delay, and an excessive number of neurofibromas. Belongs to the TMEM132 family. 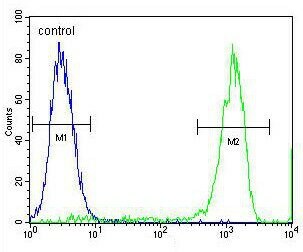 Flow cytometric analysis of MCF7 cells labeling TMEM132E with ab170376 at 1/10 dilution (right histogram), compared to a negative control cell (left histogram). FITC-conjugated goat-anti-rabbit secondary antibodies were used for the analysis. ab170376 has not yet been referenced specifically in any publications. Publishing research using ab170376? Please let us know so that we can cite the reference in this datasheet. There are currently no Customer reviews or Questions for ab170376.